Home comfort since 1948, 4th generation, family owned. We are a family owned and operated company and served the GTA for the past 70+ years. This experience, paired with our dedication to quality and over-delivering on our service promise, has established us as one of the best heating, furnace and air conditioning companies in Toronto. 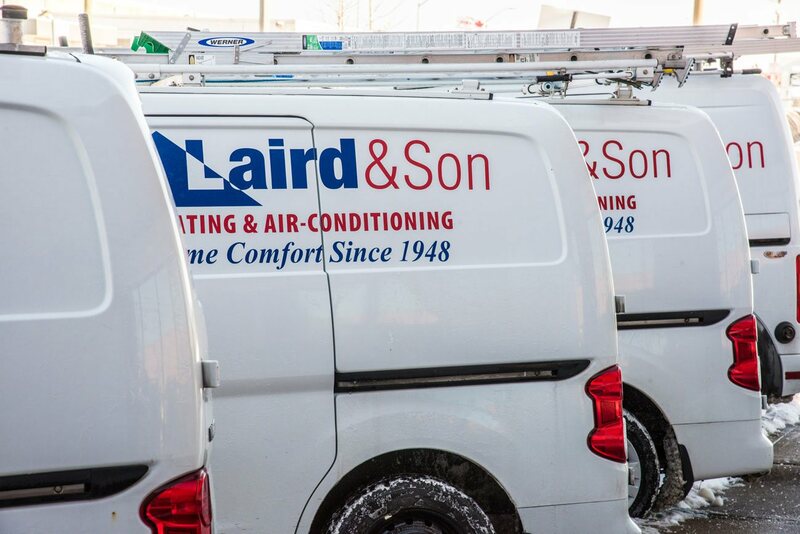 Laird & Son is the oldest independent Lennox dealer in Canada and we operate on values that place the customer first by providing swift, 24 hour emergency service for boiler repair, furnace repairs, tankless water heater repair, and air conditioner service and installations. Laird & Son Fuels Ltd. can provide service on oil furnaces, new tank installations as well as automatic fuel delivery. We take carry the best equipment with fair pricing. 90% of our business is from strong referrals from existing customers; something we are extremely proud of. We read every review that our customers leave us online. We are constantly improving our systems, our workflow and how we deliver optimal value to our community and our customers. We love what we do, and above all we enjoy seeing our customers smile. We enjoy the times when your neighbours call us to book a service job after your referral about the friendly HVAC contractor or prompt air conditioning service. That makes our day... Residential and Emergency Heating, Furnace and Air Conditioning Services serving the greater Toronto area. Improving the quality of the air you breathe in your home. Who Needs Heating and Air Conditioning Financing? Homeowners need protection from accidents and hazards. Equipment needs protection from improper installation. Laird & Son provides the best training and licensing, compliant with codes, by-laws and workplace safety. Our company is TSSA registered, Metro licensed, and owner Neil Laird is an HRAI member. His company is WSIB compliant and has $5,000,000 liability insurance, and holds his employees accountable for behaviours and cleanliness. Drop sheets are used on all jobs and plastic shoe covers on boots to keep your carpets clean and floors safe. We service and install boilers and radiant heat, service and install gas furnaces and air conditioners, install full duct systems, service and install attic air conditioning systems (high velocity and low velocity). We install gas, electric and oil-fired water heaters, tankless water heaters and combination boilers that provide hydronic heat and domestic hot water with one unit. Really, it’s no problem. At Laird and Son Toronto heating and cooling, we have HVAC financing available through SNAP financial services. You can finance your new furnace, air conditioner or complete system at reasonable interest rates with no down payment. Monthly payments are lowered with 12-year terms that allow you to pay down or pay off the loan at any time with no penalty. Laird and Son Heating & Air Conditioning installs ductless air conditioners in homes that have no ductwork or to supplement areas that receive inadequate cooling from the central air conditioning system. We provide service and annual maintenance agreements. We have moved from Laird Dr. and now service the entire GTA as the heating and cooling specialist Toronto has always recognized! Laird & Son Fuels Ltd. can provide service on oil furnaces, new tank installations as well as automatic fuel delivery. We take pride in carrying the best equipment for fair prices. Our boiler decided to stop working on one of the coldest days so far this year (-16 with the wind chill -20+). We called Laird and Sons at 5:30 p.m on Friday evening and their after hours technician was at our home within an hour and our problem was solved on the spot. We have called upon Laird and Sons in the past and they have consistently provided excellent service. A big shout out to Noah who got our (very old) boiler working in no time. All service technicians and installers wear uniforms. All of our trucks are boldly lettered. There is no mistaking who knocks on your door. When sub-contractors are used for work such as removals and chimney liners, they are TSSA compliant (meaning they have proper license and insurance coverage). You are protected from accident liability when dealing with Laird and Son.